Playing golf in New Zealand is like playing golf in California 60 years ago. It’s one of the most unspoiled and untouched golf destination on earth and home to a stunning array of golf courses set in incredible locations. The awe-inspiring landscapes, lush forests, glacial mountains, quaint fiords, amazing wildlife and a rather pleasant climate, makes New Zealand the ultimate golf escape. 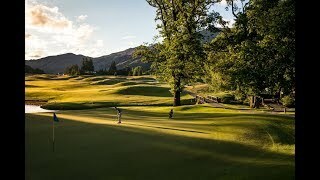 Few places in the world have natural landscapes as dramatic as New Zealand's, and it's only logical to find some of the most spectacularly designed golf courses amidst breathtaking scenery in this “Land of the Long White Cloud”. There are more than 400 golf courses around the country, two of which are listed in the Golf Digest World Top 50 rankings – Kauri Cliffs & Cape Kidnappers. Both the North and South Islands fiercely compete for the top honor when it comes to selecting best Marque and Experience courses spread throughout the country. Accessibility really sets New Zealand apart from other countries, and it’s easy to drive from alpine areas to idyllic beachside locations within a few hours. If you are looking for more than golf, Kiwi-land is the place to go where you can indulge in a wide variety of activities like kayaking, parasailing, trekking and sightseeing. The rolling hills and hedgerows collude with the irreverent, easygoing locals to disarm, distract and delight. Maori culture is potent, the surf is world class and the craft beer is awesome. Come for the golf anytime during the year and stay for a while to experience exquisite food and wine, adventure activities, quiet nature and seamless hospitality. September to November and March to May are warm and great for the outdoors, while December to February is summertime. Although June to August is winter, only a few courses in south may be affected by snow. Boasting over 140 islands, Northland is where historical sights sit alongside deep sea fishing, world class sailing and serene hiking. Each town in the Bay of Islands has its own unique culture – from the up-market lifestyle focus of Kerikeri and Paihia, to the calming atmosphere of Haruru Falls, and the quirky sea-side town of Russell. Auckland’s blend of harbor, Polynesian culture and fine cuisine has created a lifestyle ranked amongst the best in the world. From big wild rolling surf beaches to a beautiful gulf scattered with islands, little wonder it's called the City of Sails. Surrounded by diverse natural wonders including sprawling parks, natural springs, walking tracks and miles of coastline, there's lot to see and do. The Central North Island sits on the Volcanic Plateau and is New Zealand’s geothermal center, where the turbulent forces that formed the country are most evident. See the clear blue waters on a summer’s day and Lake Taupo can appear a most beautiful and tranquil place. However, it is a volcano with no top! Visit the Craters of the Moon and you will see evidence of its fiery birth in the geysers, steaming craters and boiling mud pools. About 90 minutes southeast of Lake Taupo is Hawke’s Bay - one of New Zealand’s warmest and driest regions which has contributed in making it one of the country’s leading producers of wines. Situated at the southern end of the North Island, Wellington was recently named as the “coolest little capital in the world" by Lonely Planet. Nestled between a sparkling harbor and rolling green hills, the cosmopolitan capital is renowned for its many museums, art galleries and theatre shows that make up its pulsing cultural scene. Wellington also is reputed to have more cafes, bars, and restaurants per capita than New York! A short drive from Wellington over the Rimutaka Ranges sits the wine making region of Wairarapa with spectacular coastlines. The wine village of Martinborough is well-known for its vineyards which produce some of the world’s best Pinot Noir. Nestled in beside the mysterious Lake Wakatipu, in the Southern Lakes district of New Zealand, Queenstown is a cosmopolitan haven, offering a limitless adventure, southern wine and cuisine, and breath-taking alpine ranges. It is rumored that gold prospectors - captivated by the majestic beauty of the surrounds - gave this cosmopolitan town its name. Its natural beauty changes with the seasons, the lake gleams in the summer sun and snow clad mountains tower above the township in winter. With a smorgasbord of outdoor activities, Queenstown is the country’s adrenaline capital. There's skiing in the winter and bungy jumping, sky diving, canyon swinging, jet boating, horse trekking and river rafting all year round.